Already a subscriber, but can't log in? You can set your password here. Acting Defense Secretary Patrick Shanahan. 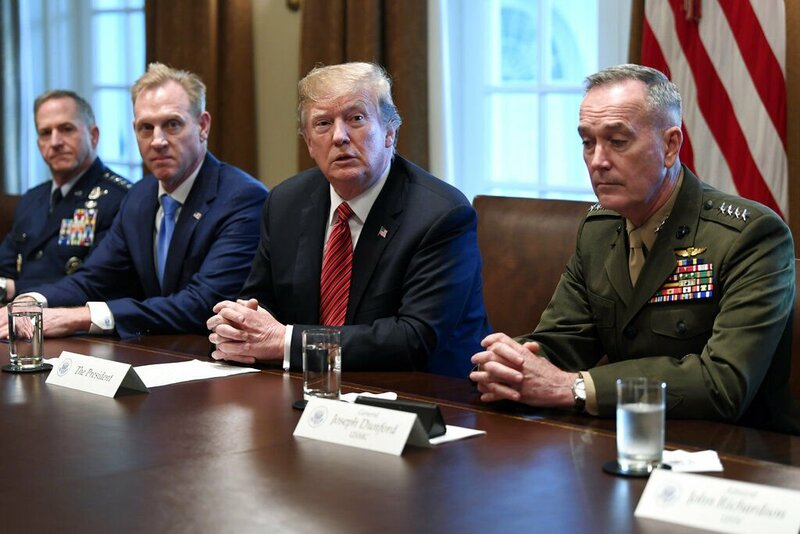 President Donald Trump, second from right, flanked by acting Defense Secretary Patrick Shanahan, second from left, and Chairman of the Joint Chiefs of Staff Gen. Joseph Dunford, right, speaks during a meeting with military leaders in the Cabinet Room of the White House in Washington on April 3. At left is Air Force Chief of Staff Gen. David Goldfein. Amid the Pentagon’s full-court press at the Space Symposium to establish a Space Force, stars appeared to be aligning Tuesday for Colorado to call much of it home. Congressional sources at the symposium confirmed that three bases in Colorado Springs — half of the six being considered — are finalists to house the new U.S. Space Command, the nerve center of the Space Force now under congressional consideration. Space Force would become a new service under the Air Force rather than a separate branch of the armed services under current plans. A contract issued late Monday will pay for $9 million in work to establish the command, work to be done at Peterson and Schriever Air Force bases, making the Space Command’s home here an even better bet. The military’s evaluating criteria, including cost, also make Colorado Springs look like the top contender, according to documents obtained by The Gazette. The Tuesday message from Acting Defense Secretary Patrick Shanahan: Space Force is coming, and it is coming quickly. “Rather than watch the world evolve around us, we are seizing the strategic initiative,” Shanahan told a crowd packed into The Broadmoor’s international center. The drive for a separate space service, often touted by President Donald Trump at political rallies, comes as rivalries heat up in orbit. Shanahan said Russia and China are honing their anti-satellite capabilities. And China soon will field a ground-based laser to target satellites in low-Earth orbit. “Both China and Russia have weaponized space with the intent of holding American space capabilities at risk,” said Shanahan, who took the Pentagon’s top job Jan. 1 with the resignation of James Mattis. It’s a big change for the Pentagon and Air Force, which resisted earlier calls for a space force, saying the service would balloon bureaucracy and cost. Shanahan said the new service, with fewer than 20,000 troops, would be cheap by Pentagon standards. “The Space Force will cost about $1.50 per American per year,” he said. That price doesn’t include a few space costs, though, such as the $14 billion that the Pentagon has budgeted for space projects in 2020. Combined with classified programs, it runs taxpayers more than $50 per American per year. Air Force Secretary Heather Wilson echoed her boss Tuesday, saying Space Force will speed American innovation and build a set of space capabilities to survive enemy attack. The first steps for the new force are underway. Air Force Space Command in Colorado Springs is planning for the U.S. Space Command, which will oversee the orbital efforts of all armed services and take charge if a war reaches orbit. The military had a Space Command for many years that managed all military space activity, but it was eliminated in 2002 when the U.S. Northern Command was set up as a response to the 9/11 attacks. The initial version of the new Space Command will be temporarily based at Peterson, and the base Command’s Gen. Jay Raymond will lead it. Peterson, Schriever and Cheyenne Mountain are leading contenders to house U.S. Space Command permanently. They’re competing with Buckley Air Force Base in Aurora, California’s Vandenberg Air Force Base and Alabama’s Redstone Arsenal. Colorado Springs boosters capitalized on having the nation’s top space leaders in town, placing a full-page advertisement in The Gazette touting the city’s virtues for hosting the new command. 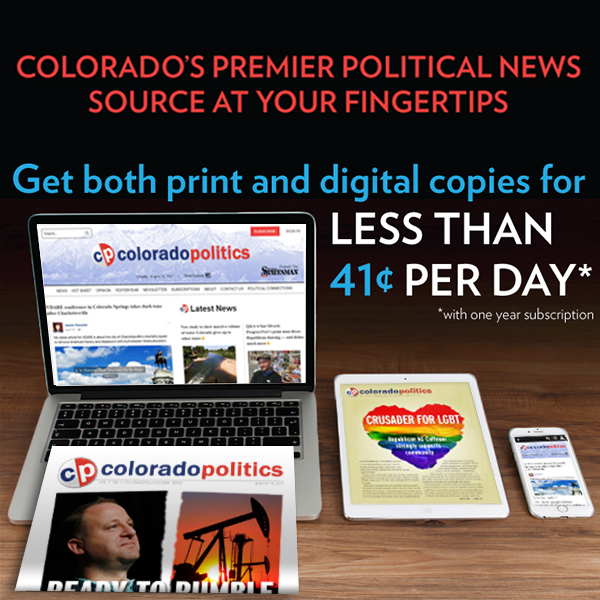 That follows efforts by Colorado lawmakers to get the command here. U.S. Rep. Doug Lamborn, R-Colorado Springs, says he’s reached out to the city’s galaxy of retired generals to show the Pentagon how military resources here will save the Pentagon billions of dollars. The command, which will have 1,450 troops, is the biggest prize up for grabs amid the Space Force push. “The advances we (already) have made collectively in the national security space arena are remarkable,” said Raymond, who is awaiting Senate confirmation as the command’s boss. He said the Air Force has developed new tactics for war, and his troops quickly have adapted to a watchful world where leaders fear satellite attacks. Raymond and the Air Force chief of staff, Gen. David Goldfein, also said Air Force pilots and space troops are working together on war plans for space. “We’re the best in the world at space, and our enemies know it,” Goldfein said. America hasn’t had dedicated anti-satellite weapons since the 1980s, though missile defense weapons could do the job in a pinch. Instead, attacks in orbit could be met with more conventional responses. “If we are challenged in space, we will respond at a time, place and domain of our choosing,” said Gen. John Hyten, whose U.S. Strategic Command in Nebraska now includes space missions. Hyten said he’s eager for the space war-fighting command, saying satellites “at best” are his No. 3 priority, with his command’s nuclear responsibilities taking the top two slots. “Somebody needs to be looking at space full time,” he said.